View of the Collegiate Church of St Mary at Shrewsbury. The spire of St Mary's is one of the dominant features of the skyline of the town. 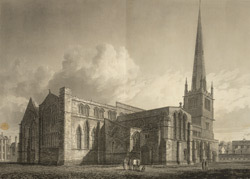 It is also the largest parish church in Shrewsbury. The west tower is made of red sandstone and is from the late Norman period. The spire is octagonal and is one of the tallest in England, standing some 183 feet in length. It is a collegiate church - that is, a church where the priests were secular canons rather than members of a monastic order.